Working with local women communities, this installation, designed by Nader Tehrani from NADAAA and Raya Kassisieh, uses hand knit wool yarn in a monumental scale to form an enclosure, spanning from the ceiling all the way to the ground. From ground loom wool weaving to cross-stitching embroidery, our featured designers find a new way for self-expression. Taking inspiration from art, Palestinian heritage, and native Jordanian tools, we see how they create intricate designs that attract viewers for their unique visual effects and textures. Ishraq Zraikat was born and raised in Amman, and is currently based in New York, where she works as a stylist, journalist, and textile designer. 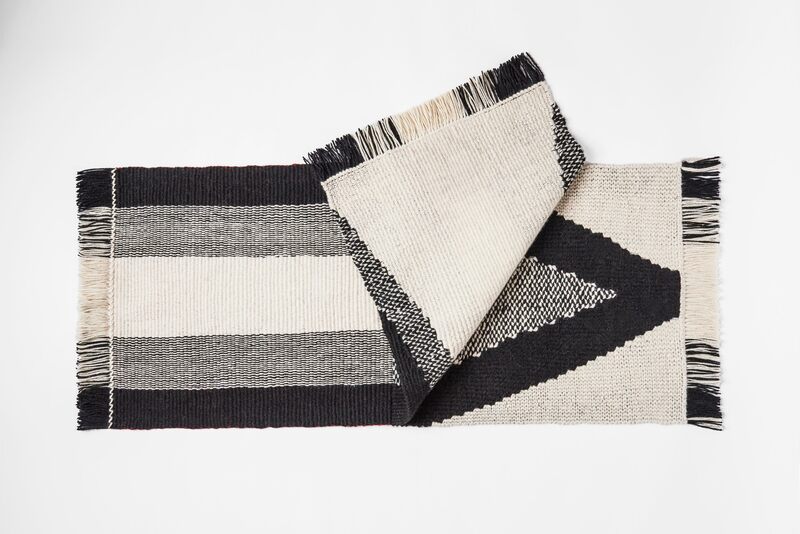 Her work focuses on hand weaving and wool processing, starting with raw wool and moving to hand-dyeing using natural plant dyes and chemical acid dyes. Using traditional manual techniques, Zraikat is always exploring new textures and materials. For her feature at the exhibition, Zraikat is showing a piece where she explores the possibilities of combining of combining cow leather with hand-dyed and hand-felted sheep wool, materials that are not often mixed together. 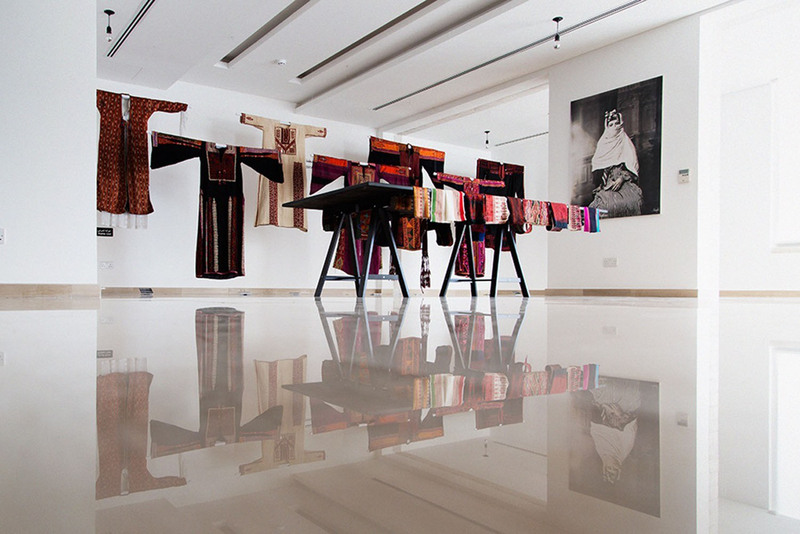 Her second piece, Prayer Rug 1, uses the traditional tools of native Jordanian rug weaving, slightly adapted to make a 'double weave' to create a three-dimensional textile, a technique that is not native to Jordan and the region. Ziad Qweider comes from a family that collects and cherishes the old Palestinian ‘Thobe’. Qweider’s fascination with this historic garment inspires him to create unique and bold embroideries, each of which tells a story about the struggle of Palestine. Qweider is exhibiting two pieces of intricate embroidery, entitled Face From Another World, and Light & Hope Through Apartheid Wall, inspired by traditional Palestinian embroidery. These works reflect their own cultural specificity as well as multiple traditions and histories. The designs are both extremely simple and complex using the designer’s personal narrative to create its form. His work is at once bold, accessible, and universal, and brings joy and happiness to everyone who sees it. Dodi Tabbaa is a Bangladeshi-Jordanian multimedia artist. Tabbaa received her Bachelor's Degree in Fine Arts and Graphic Design in Lahore, Pakistan. She did postgraduate work and received a diploma in textile design, printmaking, and typography while studying in the United Kingdom. Tabbaa’s exhibited rugs are based on her lenticular artworks, and script on the close relationship and exchange between art and design. In addition to a design inspired by the hills and mountains of Jordan entitled Nomad. 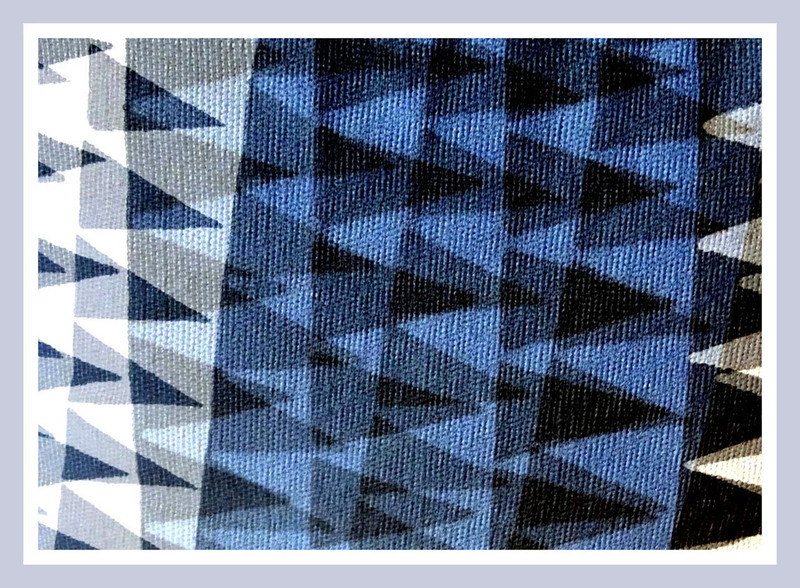 The design shows the overlapping hills in their different shades in the changing light. Through her art, Tabbaa seeks to envision worlds that are beyond our imagination. With the help of paints, inks, film, photography, and computers, she creates a glimpse of the universe she sees through her eyes. Nader Tehrani (from NADAAA) and Raya Kassisieh join together to create a dialogue between digital design and traditional craft. 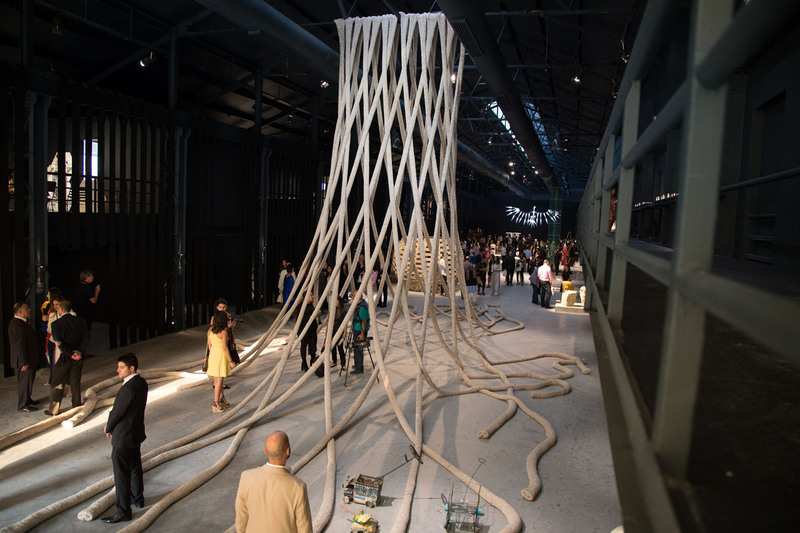 The installation utilizes simulated physics to relax knit fabric produced with a tacit knowledge of material behavior. Working with local women communities, Entrelac uses 350 kg of undyed wool yarn, which is hand knit into a monumental form. 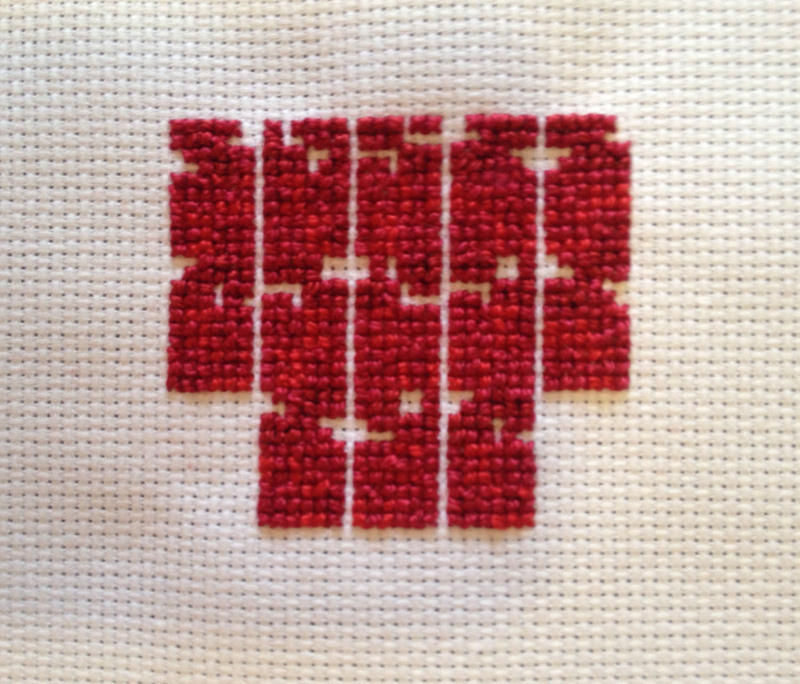 These strands are hung and again woven as a single cross stitch, at a larger scale, to form an enclosure, an architecturally scaled garment, which descends from the order and geometric exactitude privileged in the digital realm, to entropy and material reality at the ground. TIRAZ - Widad Kawar Home for Arab Dress is a Jordan-based, non-governmental organization that aims to shed light on the Palestinian, Jordanian and neighboring Arab countries’ vibrant and rich cultural heritage and living traditions. Home to the largest existing collection of Palestinian and Jordanian traditional costumes, including pieces from the 19th and 20th centuries, TIRAZ has curated more than 2,000 costumes, weavings, home utensils and jewelry items over a period of 50 years. This collection stemmed from a passion to preserve a disappearing heritage, whether due to occupation or rapid modernization and urbanization. 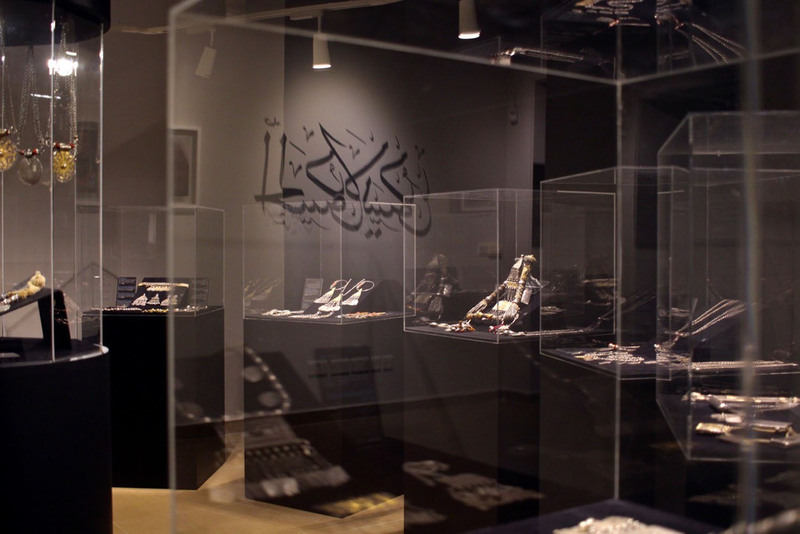 TIRAZ is a participating open space at Amman Design Week, where it will hold an exhibition featuring jewelry pieces from the early 20th century. It will also be conducting drop-in workshops during the week led by an expert embroider and TIRAZ staff.